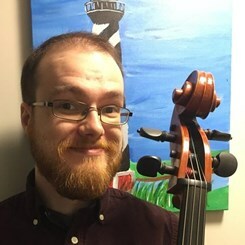 Damian studied cello at the University of North Carolina at Greensboro under Alexander Ezerman. He has performed with the University Symphony Orchestra and University String Orchestra at UNCG for four years. Has taught privately for four years and studied Music Education under Dr. Rebecca MacLeod, Dr. Brett Nolker, and Dr. Jennifer Walter. He teaches cello and violin in his spare time. He also has a certificate in Violin Repair and Restoration.